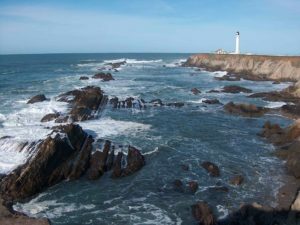 Toppled by the 1906 earthquake and then rebuilt in 1908, Point Arena Lighthouse is — at 115 feet — one of the tallest lighthouses anywhere in the U.S.
Like most lighthouses, Point Arena was shuttered as a U.S. Coast Guard operated federal aid to navigation in the 1970’s. Until a few years ago, the light was lit up once a year for the local community — a dazzling sight given there are only a few lighthouses with working Fresnel Lenses in the entire U.S. What’s more, this is a first order Fresnel: at six feet tall the biggest Fresnel Lens every made. Until 2005, the mechanism which turned the lens was lubricated by liquid mercury when it was removed as hazardous waste. Since then, the turning mechanism has not been reactivated. Thus, the lens will probably never turn again. And, until 2006, you could go up and stand right next to the lens on tours. That ended, however, when a tourist carved his or her initials in one of the priceless leaded crystal sections. Now, the most you’re allowed to do is take a look up into the lantern room from below. One person spoiled it for everyone. To make matters worse, during 2006 a piece of the lighthouse exterior below the lantern room broke loose; not surprising given the building is 100 years old next year. To keep the lens and surrounding structure in good condition, members of the U.S. Coast Guard, Flotilla 87, a citizen volunteer arm of the Coast Guard, perform regular maintenance. Despite the beauty of this rare first order Fresnel Lens and love by the local community, the future is uncertain. The Coast Guard has recommended that the lighthouse board approve the removal of the lens from the lantern room and have it moved to the museum building below. With the lighthouse in such shaky condition and no funding for restoration, it appears that removal may be the best option for saving this priceless treasure. If the lighthouse board approves, the Coast Guard will pay to have it moved. 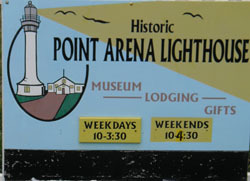 Now is the time to take a drive to Point Arena and see the light in its natural setting.